I have been a fan of peanut butter filled pretzels since at least high school. 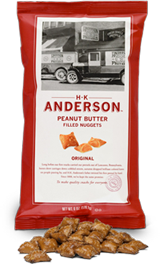 In fact, I remember trying on and buying my prom dress while eating an entire bag of these HK Anderson Pretzels! I was sent a variety of their delicious kinds of pretzels. I got the pretzel balls, salty stix, braided honey wheat, and of course the peanut butter filled. They are all very delicious! These products are sold all over and I even just saw them at Walgreens. Also, all of their products are now going all natural! One thing that you do have to watch out for with pretzels is the high sodium content. Having these products again reminds me that I need to buy my beloved PB pretzels more often! The giveaway will be for a sample package (like the one seen above) from HK Anderson. The giveaway is open until Midnight on Tuesday June 14th. Winner will be chosen on Wednesday June 15th using Random.org. The winner will have 48 hours to respond or a new winner will be chosen. Tell me what your favorite way to eat pretzels is. -Like HK Anderson on Facebook (2 entries). My favorite way to eat a pretzel are the jalapeno GIANT ones like at the mall or a fair -- dipped in mustard with a lemonade! YUMM-o! I liked HK Anderson on FB! My favorite way to eat pretzels is dipper in Peanut Butter! And I liked your Facebook page! I subscribe to your blog via google friend connect! I like my pretzels chocolate covered! My favorite way to eating pretzels in dipping them into diet ranch dressing ! love them in peanut butter! My favorite way to eat pretzels is right out of the bag! I like to eat pretzels right out of the bag! If it's a hot or soft pretzel, I like mustard on it. Thanks! With a cold glass of sweet tea! Dipping them in chocolate has always been my favorite way! I entered the Plow and Hearth giveaway. I love to dip my pretzels in Tostitos Cheese Dip. I did that back in high school and still do it! I like eating Pretzels in Chex Mix. I STILL enjoy eating pretzels with an ice cold beer! My favorite is pretzels with mustard! Soft and warm from the oven (and only lightly salted please). I like to eat pretzels with hone mustard! I love eating prezels at lunch with cubed cheese and grapes. I like making mixes with my salted pretzel bits - with chocolate! I like them with cheese. My favorite way to eat soft pretzels is with melted cheese on it. I love hard pretzels dipped in blue cheese dressing. By the handfuls. I love pretzels! I love to eat it with cheese. I love my pretzels hot, love to lick off the salt first and then dip them in mustard and cheese >> wish I had one now! I love them just the way the are.Eat them right in a big bowl watching tv. My fave way is to dip them in peanut butter. I love them with honey mustard, thanks! I like pretzels dipped in chocolate and sprinkled with crushed walnuts. I entered the Activz Vitamin D Giveaway. I entered the $25 Lovemode Gift Certificate Giveaway. I entered the Jollys Garden Shoes Giveaway. I entered the Red Gold Tomatoes Gift Package. I entered the $75 Plow & Hearth Giveaway. I entered the Bacon Hot Sauce Review and Giveaway. Not sure how other people eat pretzels, but right out of the bag is my way!Why dirty a dish if you don't need to! I love to eat them while reading a book!